DESIDOC Called Walk-in Interview for Recruiting 16 vacancies of Apprentice Jobs. The Interview will be held on 08.01.2019 to 11.01.2019 at the venue mentioned below. All qualified, as well as Interested prospects, can attend this Walk-in. Additional Detailed Info Pertaining to Educational Qualifications, Age Restriction, Selection Procedure, Test Pattern, Syllabus for Defence Scientific Information and Documentation Centre (DESIDOC) Recruitment 2018-19 Apprentice Exam shown in this article is pointed out below. 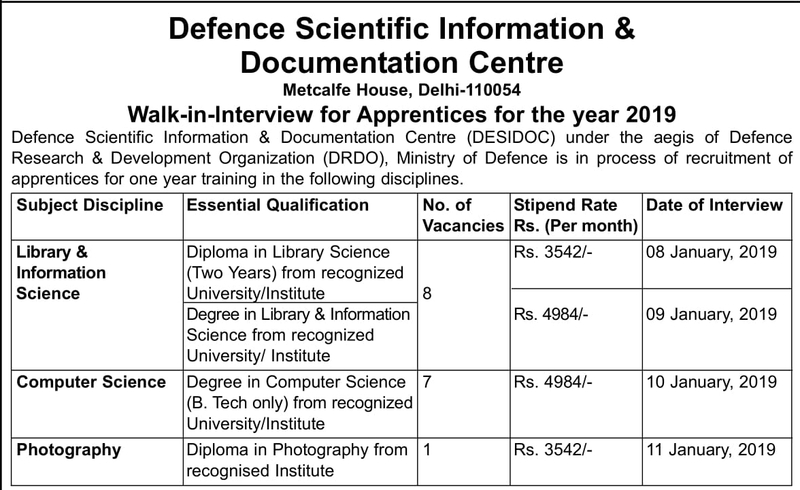 DESIDOC Recruitment 2018 – Walk in for Apprentice Posts in Defence Scientific Information and Documentation Centre. Candidates are invited by Defence Scientific Information and Documentation Centre (DESIDOC) to attend walk-in-interview to be held on 08.01.2019 to 11.01.2019 for 16 vacancies. Contenders those willing to attend for the interview must pass Diploma in Library Science / Degree in Computer Science in B.Tech / Diploma in Photography from Registered Board/Organization. Those selected for this DESIDOC Recruitment will get pay Scale of Rs.3,542 – Rs.4,984/- per month. Job Seekers who fulfill all the eligibility conditions and desired to apply against DESIDOC Apprentice notification may attend for walk-in interview along with their original documents, one set of self-attested photocopies to prove their educational qualification including attempt certificate, age etc. Check Interview Venue, Date & Time which are mentioned below.